Totally Laparoscopic Total Gastrectomy with Esophagojejunostomy Using Liner Stapling Devices. Introduction : Laparoscopic distal gastrectomy for early gastric carcinoma has been accepted widely because of its minimal invasiveness. However laparoscopic total gastrectomy is not still familiar depending on difficulty of esophagojejunomy. When performing open total gastrectomy, esopagojejunostomy with a circular stapling device has been generalized as a substitute for hand-suture. On the other hand, there are two disadvantage of this technique; firstly, purse-ring suture is necessary, and secondly it can be difficult to introduce the instrument. These problems are more serious in laparoscoic surgery than in open surgery. 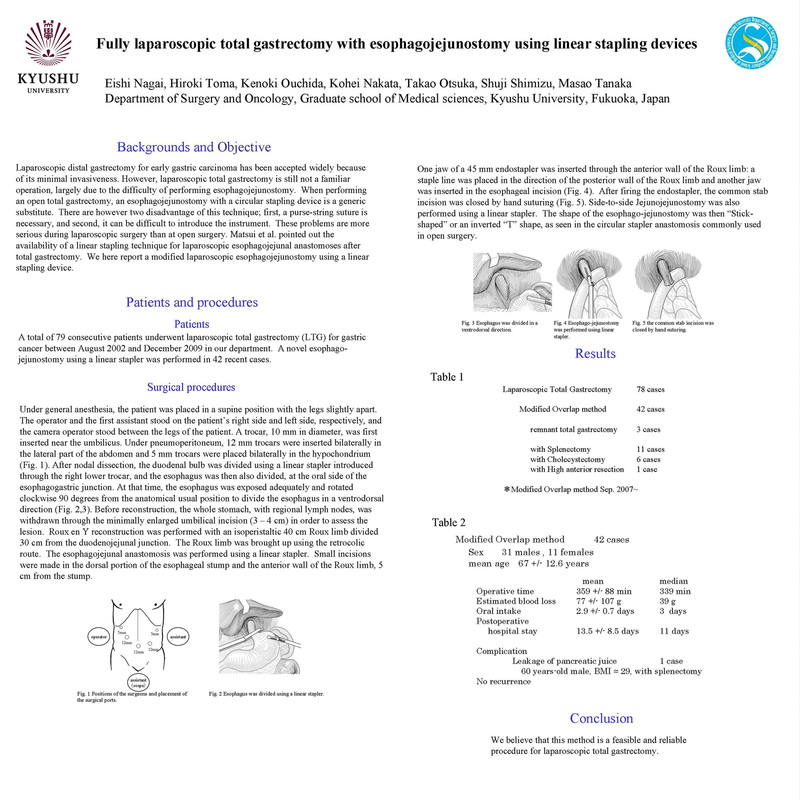 We report herein a modified laparoscopic esophagojejunostomy using linear stapling device. Patients : A total 79 consecutive patients underwent laparoscopic total gastrectomy (LTG) for gastric cancer between August 2002 and December 2009 in our department. A novel Esophago-jejunostomy using linear stapler was performed in recent 42 cases. Procedures : The patient was placed in a supine position with legs slightly apart. The operator and the first assistant stood on the patient’s right side and left side, respectively, and the camera operator stood between the legs of the patients. After nodal dissection, the duodenal bulb was divided using linear stapler through the right lower trocar, and then the esophagus was also divided at the oral side of the esophago-gastro junction. At that time the esophagus was exposed adequately and rotated clockwise 90 degrees from the usual position to divide the esophagus ventro-dorsal direction. Before reconstruction, the whole stomach with regional lymph nodes was withdrawn through minimally enlarged umbilical incision (3cm) to check up the lesion. Roux en Y reconstruction was performed with an isoperistaltic 40cm Roux limb divided from at 30cm from the duodeno-jejunal junction. The Roux limb was ascended through the retrocolic route. Esophago-jejunal anastomosis was performed using linear stapler. Small incisions were made at the dorsal portion of the esophageal stump and anterior wall at 5cm from the stump of the Roux limb, respectively. One jaw of a 45-mm endo stapler was inserted through the anterior wall of the Roux limb and s staple line was placed in direction of the posterior wall of the Roux limb and another jaw was inserted in esophageal incision. After firing the endo stapler, the common stab incision was closed by hand-sewing. Side-to-side Jejuno-jejunostomy was also performed using linear stapler. The shape of the esophago-jejunostomy was then “Stick”-shape or inverted “T” shape as seen in circular stapler anastomosis commonly used in open surgery. Results : This study group consists of 31 males and 11 females; mean age 67 +/- 12.6 years. The mean operative time was 359 +/- 88 min, mean estimated blood loss was 77 +/- 107 g. Neither open conversion nor postoperative complications such as leakage and anastomotic stenosis were encountered in this series. The mean time to resuming oral intake and postoperative hospital stay were 2.9 +/- 0.7 and 13.5 +/- 8.5 days, respectively. Conclusion : We believe that this method is a feasible and reliable procedure for laparoscopic total gastrectomy.